Helmets are considered as one of the most universal forms of armor. 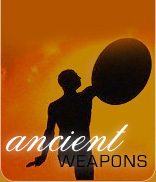 Offering a defensive covering for the head, helmets protect the head, face and sometimes the neck of the warrior from the cutting blows of swords, spears, arrows and other weapons. 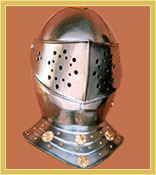 The Burgonet : a light weight, open-faced helmet developed in Burgundy was 16th century Europe. It was used by the cavalry as a substitute to heavy closed helms. They have a peaked brow, combed skull, and hinged ear pieces. Some had a panache or a plume holder. Visored Helmet : it was a steel helmet that covered entire head. The opening in the front had a visor that could be raised or lowered. This gave a limited visibility. Coif : it was a hood of chain mail. It had a ventail neck cover, usually worn under a helmet as a further buffer against blows. The Morion : it was an open of the mid 16th century and was worn by a foot warrior. It had a wide brim and a comb. It was popular because it was cheap and affordable and the design could be altered.